Webers are designed to supply fuel determined by the demand put on the engine. When demands are small, only the primary barrel is used, and when demands increase, the second barrel kicks in to deliver the performance needed. The new 32/36 DGEV conversions for the AMC/JEEP will deliver up to 18% hp increase over the stock factory carb as well as 10-20% in fuel economy (depending on your driving style). For pure power with no concern for fuel economy, Weber has put together a kit using the larger 38 DGES carb. This model is made for the 258 engine and provides more radical acceleration and more bottom end torque while maintaining the same top-end performance as the 32/36 DGEV. 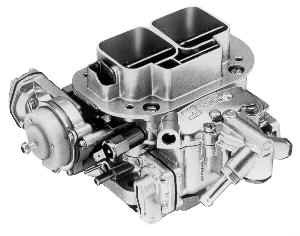 The K550 and K551 utilize the 32/36 Progressive Weber and are designed to be an economical performance carburetor conversion increasing Hp without sacrificing drivability and fuel economy over the stock carburetor. The K551, or any kit using the 32/36 progressive carburetor is the optimum carburetor for use as a performance replacement carburetor for a worn out or hard to maintain factory carb. The 32/36 is DGEV has a 32mm primary barrel with a 36mm secondary barrel. The Redline Weber kit with the 38 mm DGAS carb will perform on a stock unmodified 6 cyl engine. This is not an over carbureted application. It will provide more initial torque and acceleration but the top end performance will not be significantly improved over the 32/36 when used on a stock motor. The 38mm DGAS carb is best suited for engines which have been modified or will be modified in the future. Generally these motors will be improved over stock with oversize pistons and towing cam and the 38 will enhance most modifications. The 38 has a larger fuel delivery system and the calibration to handle a broader range of improved performance. While the 32/36 progressive carb will improve your fuel economy on a stock motor over the OEM carb, the 38 Synchronous carb will generally not get less fuel economy than the OEM carb. NOTE: Check local laws regarding emissions control and street use in your state. Not legal for highway use in CA.